The Constitutional Chamber of El Salvador's Supreme Court may be wading once again into a major conflict with the other two branches of government. The Chamber announced that it will hear legal petitions claiming that the president of the Supreme Court was unconstitutionally elected by the National Assembly. Salomón Padilla was elected by the National Assembly in August 2012 as part of the deal which ended last summer's constitutional crisis. Padilla had been a member of the FMLN prior to being selected for the court. The petitions allege that this party affiliation violates the independence necessary to be a member of the judiciary. The petitions come after the Constitutional Chamber had earlier nullified election of judges to the Court of Accounts on the grounds that the legislature had not verified their credentials and that they were not independent of partisan interests. 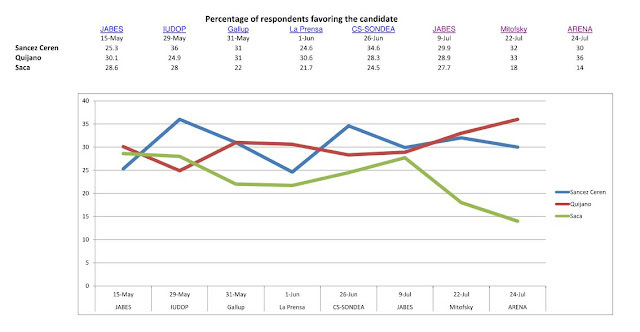 There have been at least eight sets of public opinion poll results released since May 15 concerning the upcoming 2014 presidential election in El Salvador. Starting today, I will try to keep a running tally of the polls so you can see where the race stands. I have put all these results in a spreadsheet which anyone can download from this link and do their own analysis. The spreadsheet also has live links to the sources where all these poll results were originally published. Obviously not all polls are of equal quality or are free of bias. For example, the last two polls, by the ARENA party and traditionally conservative Mitofsky, I would expect to have some bias against Saca, and they produce the lowest numbers for the former president. In a future post, I will look at how the different polling organizations have fared in predicting previous elections. On a recent day in El Salvador, the power of volcanoes and floods to devastate communities through the centuries was powerfully illustrated for me. My morning was spent at Joya de Ceren, an archaeological site dating back to approximately 600 C.E., which is currently being excavated. It is one of the top archaeological sites in El Salvador and is a UNESCO World Heritage site. Joseph Frazier was a journalist covering El Salvador's civil war during the 1980s. This year he published his memoir, El Salvador Could Be Like That: A Memoir of War, Politics and Journalism on the Front-Row of the Last Bloody Conflict of the US-Soviet Cold War. My memoir is a ground's-eye view of the El Salvador war and of what it did to the peasants, the soldiers, the school kids, the union leaders, the shopkeepers, the fishermen and artisans, the parish priests - the everyday, unremarkable people who often wound up in unmarked graves and on the edit-room floor. It is also a look at the politics and economics and social history that underpinned the conflict. The book is at its best when Frazier gives first person accounts of events in El Salvador which illustrate the senselessness and the horror of much of the war. And the book provides many of those accounts. There should be no doubt that David Munguía Payés is close to Salvadoran president Mauricio Funes. Funes named him to be Minister of Defense in 2009. Then in November 2011, Funes named him to be the Minister of Public Security. Upon taking office as Minister of Public Security, Munguía Payés famously forecast that the government would reduce the homicide rate in the country by more than 30%. In fact, the homicide rate decreased by more than 50% as a result of the gang truce in March 2012. That truce remains controversial and fragile today. Peterson Crisanto (BRA), 21, has won the Association of Surfing Professionals (ASP) 6-Star Reef Pro El Salvador over Josh Kerr (AUS), 28, in dominant fashion, earning his first major victory in clean four-to-six foot waves at the world-class righthand pointbreak of Punta Roca. Crisanto, who was a standout throughout the entirety of the Reef Pro El Salvador, returned to form on the final day of competition, dismantling the flawless walls of Punta Roca with incredible poise and variety on his forehand. You can watch a video of some of the action here. One of every 12 Salvadoran girls is a mother by the time she is 15. In the poorest areas of the country, that number rises to one in five. One of every three Salvadoran girls has had a baby by the time she is 18.29% of all births in the country are to girls between the ages of 10 and 19. 304 girls between the ages of 10 and 14 are heads of households. 4,674 households are headed by teenage girls between 15 and 19 years old. Both the teenage mother and her child (or children) has a significant struggle to avoid a life mired in poverty. 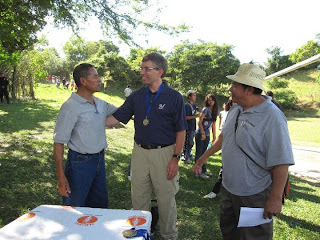 This is the 2000th time I have written a post on Tim's El Salvador Blog since I started the blog back in November 2004. What started as just a way to educate myself about current events and politics in El Salvador has lasted much longer than I ever would have thought. I want to express my sincere thanks to all of you who have helped me along the way with insights into El Salvador, with article ideas, and with your words of appreciation. From Salvadoran food to continued impunity for human rights violations in the civil war, from the historic victory of Mauricio Funes in 2009 to the complexity of the gang truce, and from the memory of Oscar Romero to wonderful tourist sites in El Salvador, I've had the opportunity to share with you many of things which fascinate me about El Salvador. I'm looking forward to the next thousand posts, especially as I start the coverage of the three way presidential election in 2014. Murders surge -- is gang truce breaking down? Over the past two weeks, the number of daily murders in El Salvador has surged, prompting many to question whether the truce has collapsed, how the government should respond, and igniting fears of a return to the pre-truce levels of violence in the country. SAN SALVADOR (Reuters) - El Salvador has seen a burst of violence, with 103 homicides this week, the government said on Friday, as a year-long truce between the country's violent gangs appeared to be crumbling. The uptick in murders in the Central American nation echoes killing rates before the March 2012 truce between the Mara Salvatrucha (MS-13) gang and rival Barrio 18. If you are a long time reader of this blog, you know I have nothing good to say for Mary Anastasia O'Grady, the Latin America opinion writer at the Wall Street Journal. She was at it again recently in an editorial titled US Aid and El Salvador's Corruption. Her basic premise is that El Salvador's government is corrupt, and does not promote markets which are fair and investor friendly. In this most recent piece, she attacks the US State Department for aid projects such as the Millennium Challenge grant and the Partnership for Growth. Luckily, this time I don't have to do all the work to pick apart O'Grady's loose use of statistics and lack of a deep knowledge of El Salvador. Mike Allison at Central American Politics has already done a great job of it on his blog. Read it here. A new documentary airing on public television in the US this week, highlights the search for children "disappeared" by the armed forces during El Salvador's civil war. As soldiers carried away children from their homes in conflict zones, a corrupt system of adoption lawyers, orphanages and officials placed children for adoption both inside the country and as far away as Italy.